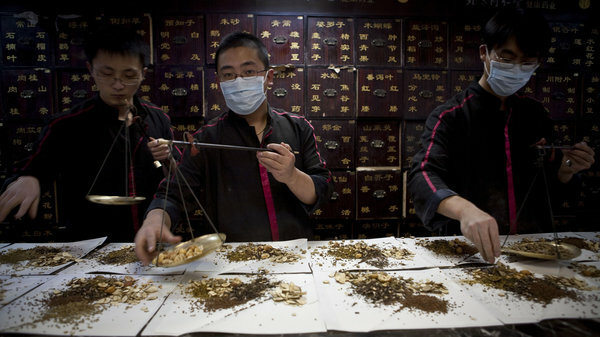 In the quest for new treatments, U.S. researchers are looking to traditional Chinese medicines, some of the oldest remedies in the world. A recent discovery resulted in a better treatment for a type of leukemia that strikes about 1 in 250,000 people in the U.S. Another study found a potential new painkiller in China’s medicine chest. Other researchers are studying a traditional medicinal plant called “thunder god vine” for its anti-cancer properties. The approach has already had some success. The Chinese herbal medicine artemisinin, for instance, has gone on to become the most potent anti-malarial drug available. Not all the leads have panned out, of course. But the old field has shown enough potential to keep interest high. A better leukemia treatment drawn from an ancient medicine should give us hope for developing anti-cancer drugs, says Dr. Samuel Waxman, a co-author of the report and professor of medicine and cancer specialist at Mount Sinai Hospital. “It gives a lot of optimism of seeking other types of cancer medicines in the Chinese pharmacopedia, which many people are looking into,” Waxman says. The treatment uses arsenic trioxide, which has traditionally been used in Chinese medicine. The U.S. Food and Drug Administration approved arsenic trioxide (sold as Trisenox here) as a treatment in 2000, and later research showed that patients who received standard chemotherapy followed by arsenic trioxide did better than patients who just received standard chemotherapy. But a big clinical test recently found that the drug, in combination with all-trans retinoic acid — another drug commonly used to treat acute promyelocytic leukemia (APL) — turned out to be more effective than the usual chemotherapy. That results means arsenic trioxide should become the new standard for patients that can use it, says Dr. Richard Stone, director of the adult acute leukemia program at the Dana-Farber Cancer Institute. He says there are still side effects from the new regimen affecting the skin and heart, but for most people they’re less of a problem than the hair loss, vomiting and diarrhea that can come with chemotherapy. The arsenic trioxide treatment was developed by a Chinese doctor working in northern China during the Cultural Revolution, according to Mount Sinai’s Waxman. This doctor couldn’t use much Western medicine, so to treat his APL patients, he started giving them arsenic trioxide intravenously. He kept a journal for 10 years and noticed that it worked remarkably well. He eventually published his findings in 2001 with other collaborators. “That was one of the first examples of a targeted treatment in all of cancer,” Waxman says. I've had literally hundreds of massages in my life. While I believe there's no such thing as a bad massage, I can say that Jennifer gives me the absolute best massage I've ever had. Period. — Terry R.
I have known Jen for a long time, and I have the utmost respect for her. Her skill as a healer is matched by her compassion. I consider her to be one of the best acupuncturists (and more) in this area, and I have recommended her many times. Whether you're just trying acupuncture for the first time, or have used it for a long time and you're looking for a new provider, Jen is a fantastic option. — Geoffrey W.